Hope For The Warriors staff, Army Sergeant Michael Costanzo and his children with their new travel trailer courtesy of Hope For The Warriors and its A Warrior’s Wish program. For video and more photos, visit: https://bit.ly/2KM7eYM. ASHLAND, Va. (July 12, 2018) –Growing up camping with his family, Army Sergeant Michael Costanzo has had a lifetime connection to the outdoors. Since retiring from the Army, Costanzo has been searching for a new way to still enjoy his favorite pastime with his family that is more accommodating to his combat injuries. 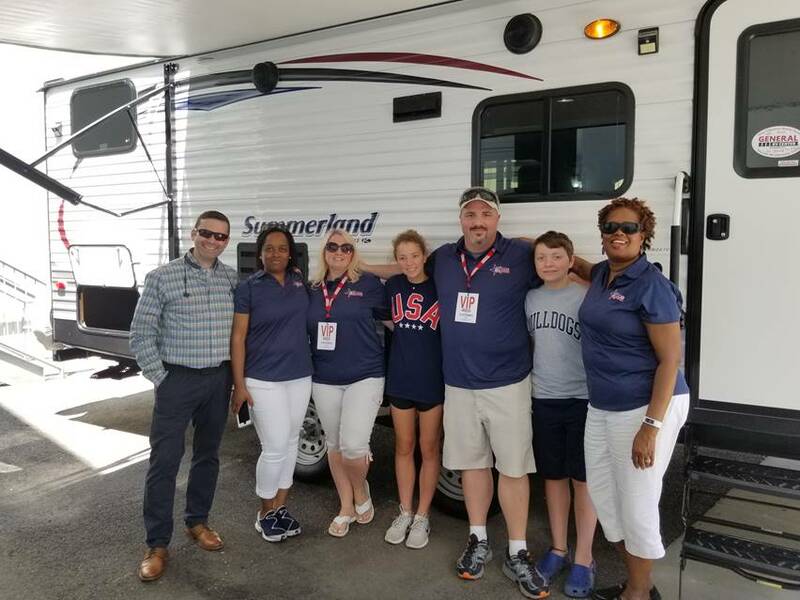 Now, thanks Hope For The Warriors® and its A Warrior’s Wish® program the father of three can once again enjoy the freedom to camp with his family with his 2015 Keystone Summerland 267BH-ISL travel trailer. In addition, American Truck and Trailer in Manassas is gifting Costanzo a hitch and calibration allowing him to transport the travel trailer with his current truck. “This was such an amazing gift,” said Costanzo. This is much more that getting a trailer, it has brought the family and my wife and I together. We are planning trips that we can afford and actually go out and do. “Hooking up and heading out is not a country song anymore, it is my life. I cannot tell you how much we appreciate Hope For The Warriors,” he added. In 2000, Costanzo enlisted in the Army and was recruited as a Counter Intelligence Agent. Prior to the 9/11 terrorist attacks, he sat in an office handling intel reports. Following 9/11, in December 2003, he deployed to Tall A’far, Iraq for one year serving as an interpreter and gathering intelligence. His mission was to gather information in person from local Iraqis. In 2004, his vehicle hit an improvised explosive device (IED) and rolled over resulting in back injuries. Costanzo was treated for his back in Kuwait and sent back to limited duty in Iraq. Upon returning home, he was sent to Walter Reed National Military Medical Center for multiple back surgeries and also began seeking mental health treatment. He was reassigned to Fort Belvoir and served as recruiter for the Counter Intelligence. After more than eight years in the Army, Costanzo retired from the military. Since retiring, he has worked for a nonprofit assisting veterans find employment. Since the program’s inception, A Warrior’s Wish has granted 185 wishes. For video and more photos, visit: https://bit.ly/2KM7eYM.